Recently, Usource completed an economic analysis of a hydroelectric project for a large University. The University was looking to meet sustainability goals while also lowering energy costs. With this project the University had the option of owning the asset or contracting for the power through a Purchase Power Agreement (PPA). In either case, it was looking at a long term commitment of 20 years or more so a strong economic analysis was needed. 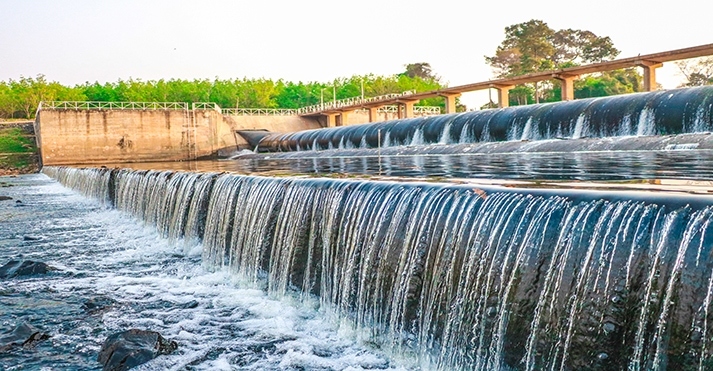 Hydroelectricity is one type of Distributed Energy Resource (DER) system. DER systems produce and/or store electricity and are directly connected to a local distribution system or a company-host (end-user). Commonly known types of DER systems include solar PV panels, wind turbines, and combined heat and power (CHP). Most DER investments are long term commitments. The underlying drivers of the economics, such as: supply and demand fundamentals, environmental policy, and technological changes, can present significant uncertainties. When evaluating DER investment decisions, it is important to test the sensitivity of the economics to changes in the key driver. In this case, the University wanted to look at the opportunity for a 10 Mega-watt hydroelectric facility near its campus. The facility would have an interconnection to the grid. The project was attractive to the University because of its location and its potential contribution to achieving near and longer-term sustainability goals. We started our analysis by identifying the variables that would drive the economic value of the project. The economic model created to evaluate the return on investment considered the environmental attributes as well as the avoided energy purchases. We tested the potential ranges of uncertainties in the previously defined value drivers to determine the sensitivity to the returns. So that the University could see potential outcomes, a few critical drivers were isolated and scenarios were constructed based on them. Through this scenario method we were able to identify risks and impacts, as well as provide constructive steps the University could take to increase the probability of a desirable outcome. Overall, the project was an attractive option to meet sustainability goals as well as manage electricity costs as part of the University’s total supply portfolio. We continue to advise the University as it looks to move the project forward. If you are interested in an informed, analytical, fact-based approach to evaluating the potential for renewable and distributed energy resources, Usource can help. Unlike with transactional energy brokers, we develop and execute a customized plan for procuring your organization’s energy. Contact your Usource advisor today to learn more. Scott MacDonald is Usource's Managing Director. Scott has 25 years of experience in the energy industry and is a recognized expert in energy economics and consulting. He has a MS from MIT and a BA in economics from the University of New Hampshire.